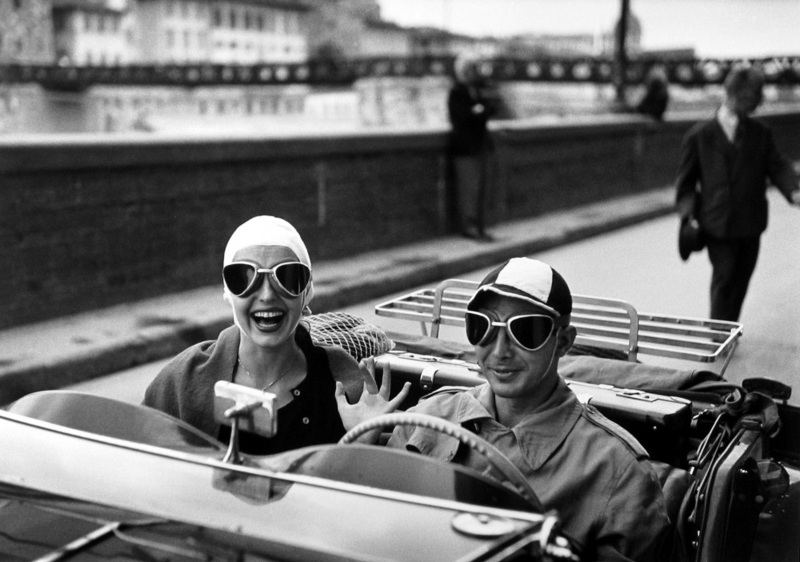 Last week, The Eye of Photography published the very interesting article Ninalee Allen Craig, the beauty in Ruth Orkin’s famous photo of Florence, dies at 90. The photo in question is below and, instead of publishing the link in our weekly list, I wanted to discuss it separately because it encapsulates so much that is fascinating in photography, some of which has occasionally been discarded since then. And what better place to do that than in our long neglected series “every story tells a picture”? Onwards! Let’s start with the “American girl”, model Ninalee Allen Craig, almost dead center (rule of thirds? yeah, right) This is a real scene (although a second pass) and waiting for the model to be absolutely in the center would have taken her too close to the 2 guys on the left. But to all intents and purposes, she is dead center. She is the subject of the photograph. And in a very crowded scene, she overlaps with no one and nothing competes with her for attention. In fact, the parallax from a downward facing lens creates focusing lines that all lead to her and pin her down to the floor. Then, there is that almost unbroken diagonal of men, again incredibly well spaced out with no overlap but several planes deep, bellies sticking out, hands holding crotches, and every glance turned towards the model, each stare acting as a vector pointing you back to the middle of the frame, and the model’s face. You could add a cage and chains, the model would not look more trapped than she is by that very natural and intelligent composition. Where the diagonal breaks, there are only walls and pillars. The right of the image is blocked by the guys laughing on the moped. She is alone, she is a woman in a world of men. And there is literally nowhere to go where she won’t be eyed like a piece of meat. Technically, if the model is the fulcrum, the large group of men on the left is balanced out by the much stronger but smaller and further out group of men on the moped, at far right. Because of this balanced composition, the image feels very stable. … To me and other interviewers in recent years, Craig insisted that the photograph from Florence had become misinterpreted. “At no time was I unhappy or harassed in Europe,” she told me in 2011. Her expression in the photo is not one of distress, she said: Rather she was imagining herself as the noble, admired Beatrice from Dante’s Divine Comedy. So, yeah, how men “appreciate” women has probably changed for the better over the years, in Italy and elsewhere. We rarely hold our crotches to respectfully signal appreciation for beauty these days, right 😉 But that is irrelevant to the real story being told in this photograph, which is a game, a dialogue between the lone noble stranger and the local men. An assertion about independence, freedom and self-determination. Nothing like the oppression some commentators have suggested in the past. And I’m sure the composition would have suggested far more tension than this if the subject had been about harassment. Here, the perfectly balanced composition uses the men as a frame for beauty more than anything else, a jewel case, almost. All in all, “American girl in Italy, Florence” is one of The Greats, because it is all about making a choice and bending all the rest of the process to your vision. Squander thou not thy talent on gear and likes, but focus on choice and composition. I have spoken. I see only one man who is possibly holding his crotch, so if your arguments are based on crotch-holding, I don’t think they’re very well supported! I’m not arguing or disagreeing…I don’t know enough to do either…but that particular criticism just doesn’t appear to be accurate. Hi Fran, not sure what criticism you are describing here. My point (or rather, the photographer’s point) is that the photograph is meant to look like it’s a menacing environment, when in fact it isn’t at all. It’s just very cleverly put together. Cheers. I think the most important point of the photo is that this is a staged second shot; it is a do over that was re choreographed to conform to the romantic theme adopted for the photo assignment. Everyone in the photo is an actor in a princess story. If you want to see the latest PC (not flash sync socket) version of the modern day princess story see any of the millions of yoga poses at sunset on social media, just be aware that these will be more artificial, more contrived and way less romantic. These days there is much ado about cultural appropriation and exploitation. Will any of the feminists be asked to retrospectively apologise about the cultural appropriation mentioned in the article? Probably not. 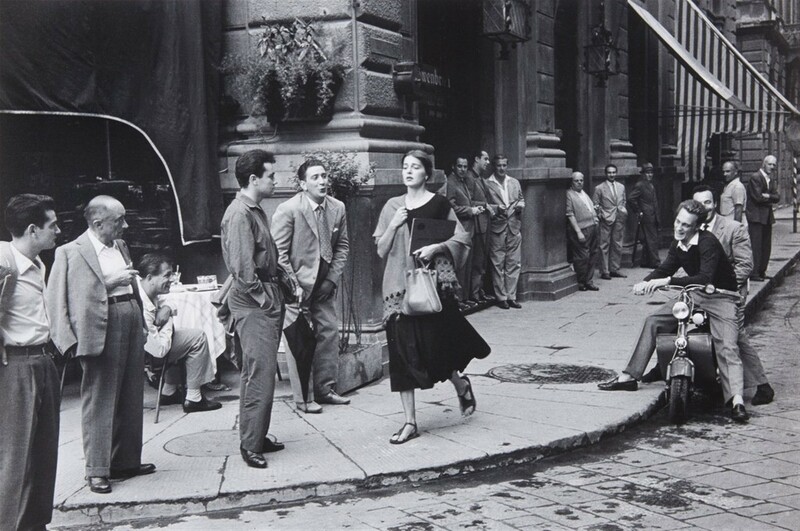 Should Ruth Orkin be seen as a cultural colonialist for ‘exploiting’ the men in this scene which conforms to a certain prejudice about Italian men? No way, they were all participating in the civil theatre of street life which is disappearing fast all around the world. Hi Noel, exactly !!! Unlike what some would have, this is not a photograph of anyone imposing on anyone else. The men aren’t harassing the model. The photographer isn’t manipulating the men. The whole Florence shoot lasted 2 hours so this rearrangement of this scene for a second walk couldn’t have been very long. To me, it’s a miracle of laid-back intelligence. Everybody probably had a good laugh and the resulting photograph is fantastic. I’m very admirative of that capability, even when (as she freely admits) she has manipulated the scene to some extent. I also really like the story behind the photograph, of the two American women meeting abroad, hitting it off and spontaneously producing such incredibly high quality art in so little time. Call me a romantic 😉 And yes, the Yoga poses in the sunset are so, sooo contrived compared to this poetic adventure. She couldn’t possibly have manipulated the result anywhere NEAR as much as people seem to think they are entitled to, these days – and still want to call their masterpieces a “photograph”. It’s easy to be too over-analytical with works of art (and I DO choose to include photography here). I prefer to enjoy what I am looking at – and see it as I see it. If someone else wants to view it differently, that’s entirely their affair. Perhaps my reaction is tinged by the evening I have just spent. We went out to dinner at a local restaurant. Before we went out, I looked it up on the net to get a fix on parking nearby, and caught sight of a review by a local “food critic”. The man in question usually irritates me – in this case, he opened up by saying he’d reviewed the same place several years ago when they first opened, and slammed it – what a lovely way to treat someone’s new business! – so helpful and considerate! But he’d now been back again and it was now “acceptable”. It should surprise none of you to learn that the same critic has an interest in another restaurant, just over 5 minutes away from this one! I was raised on the idea that if you haven’t anything nice to say, you shouldn’t say anything at all. Occasionally we run into exceptions – Adolf Hitler, for example. But this lady’s photos? – there are now three on this posting – I enjoy them all, and I adore the one central to Pascal’s article. Maybe that’s because of the years I spent in the company of my Italian girlfriend – who knows? – I just think that photo is pure genius. Good art is effectively the willing suspension of disbelief, nail that bit (easier said than done of course) and the whys and hows of whatever was done to achieve the work become largely irrelevant (away from genres that demand documentary accuracy of course). I think that’s the case with work presented here, so thanks for this post Pascal!